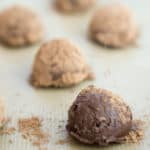 Easy Chocolate Truffles | Keto, Low Carb! With Valentines Day right around the corner, these Easy Chocolate Truffles are a must make for your to-do list! Everyone is a chocolate lover at heart so these are the perfect dessert to surprise your sweetheart and indulge in guilt-free. They are quick and easy to make ahead of time and rich enough you'll only need one or two to truly satisfy your sweet tooth cravings! We've made low carb truffles before, but they pale in comparison to these. This recipe was the result of Matt's desire to make something over the top for Valentines Day this year because we have a tradition to cook a meal together and then have a dessert we can enjoy and feel good about afterwards. After I taste tested these truffles I fell in love with Matthew all over again and can't wait to make these year after year! Chocolate is a girls, guys and child's best friend so naturally we have some amazing low carb, keto friendly chocolate recipes that are guaranteed to impress everyone alike! We'd highly recommend starting with this truffle recipe, but then quickly moving on to our keto chocolate bar recipe, next to our low carb chocolate donuts, and then finally our homemade, chocolate almond butter! And, that only scratches the surface. We don't like to toot our own horns, but we have some of the best chocolate recipes you are going to find suited for a ketogenic diet! ​Five ingredients for your new favorite dessert recipe is a great bargain. You can even get a little wild and add in some finely chopped up nuts or berries to make them even more indulgent! With most of our recipes, just like this one, we like to give you a perfect base recipe so that you can tailor it to your and your family's preferred taste. This easy chocolate truffles recipe is going to be a huge hit on Valentines Day and any other day you choose to make them! Recipe can be quickly added to MyFitnessPal - Search "KetoConnect - Easy Chocolate Truffles"
Finely chop up the entire 4oz bar of bakers chocolate and set aside. Heat a medium, bottom heavy skillet to medium heat and add the heavy whipping cream. Bring to a light boil and then remove from heat. Allow to cool for 1 minute. Add in the powdered erythritol, stevia and chopped up chocolate. Give it a light stir and then using an immersion blender, mix together the mixture until fully combined, uniform and you get a thick chocolate consistency. Pour combined mixture into a loaf pan and place in fridge for 1 hour and 15 minutes. 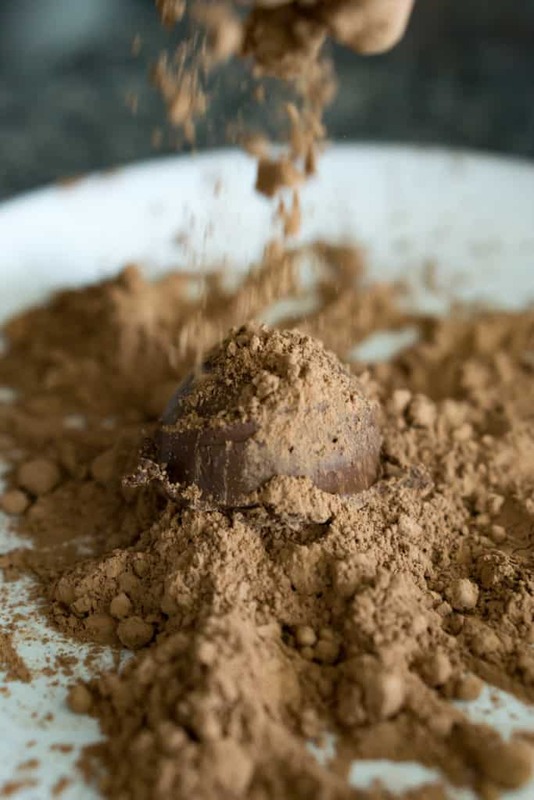 Pour some cocoa powder out on to a plate for rolling the truffles. 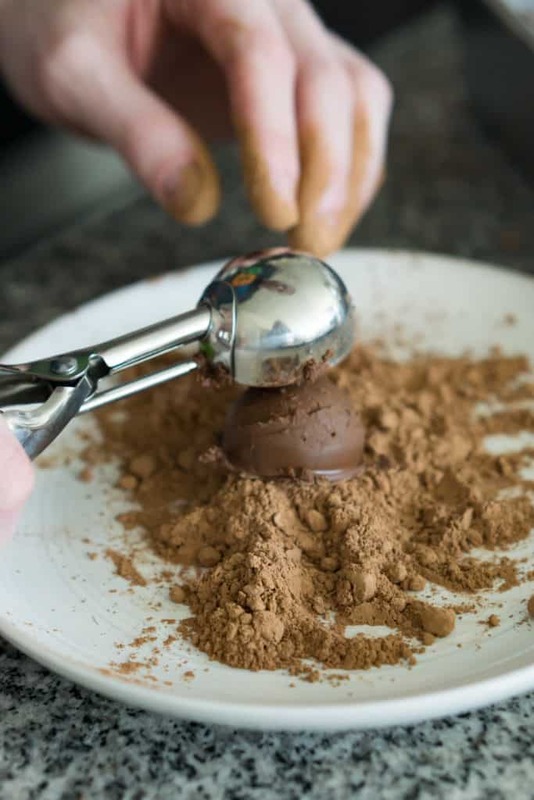 Remove the mixture from the fridge and using a 1 inch cookie scooper, scoop out 12 truffles. After you scoop each truffle out drop into the cocoa powder and roll to cover the entire surface and then place onto a separate plate. Repeat until all truffles are complete. Store in the fridge to re-harden prior to serving. Will keep for up to 5 days if stored in a sealed container. Enjoy!